Once upon a time our boys were cheap to feed but things have changed just a little. I don't know how much they weigh in this picture but I suspect they were about 2 months old and growing like bad weeds. Here you see the crew. You really can’t see the interest they are showing in this plastic bag. but I assure you that they are. That’s jack with his weirdly shaped horns trying to get his head through the fence. What could possibly be in the bag you ask. Here is a better picture of a goat being really interested. 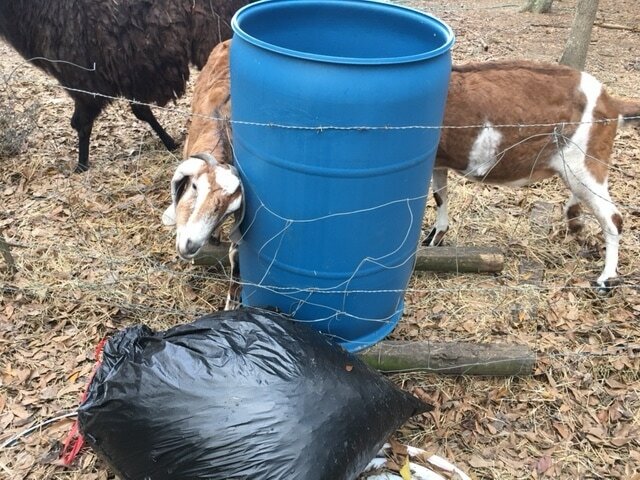 Despite what you might hear goats don’t dine on plastic. At least mine don’t. This bag contains leaves and Beau cannot wait to get it open. Nice Horns Beau! Now we live on 5 acres with bunches of trees and you would think the goats would eat them if they liked them. At first they did. Then they got tired of it. I never really paid attention to their acquired lack of interest in the fallen leaves. 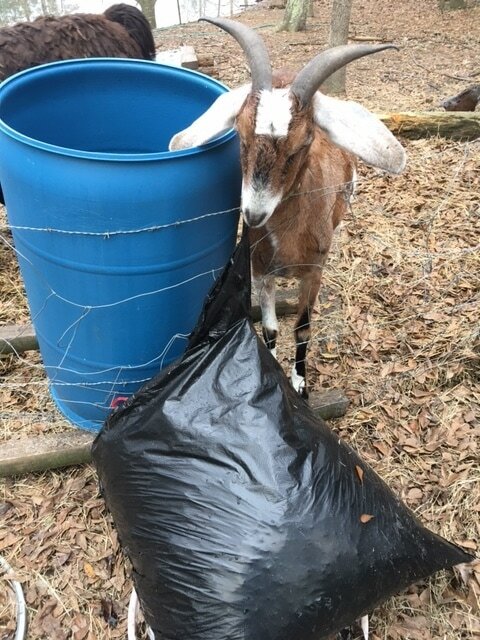 Then one of my friends asked if I would like to have a few bags for the goats. I replied that I would without thinking. When the leaves arrived I put them into a feeder and the goats tore into them with relish. I guess how something is served can become as important as the taste. They have now eaten about 10 bags full and I think I’m going to buy another rake and fill some feeders.In the meantime, they are happy.